Becky Peterson/Business InsiderLet the good times…oh never mind. 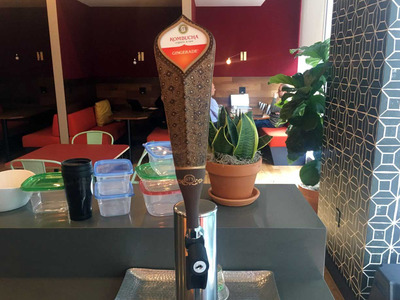 WeWork recently switched out its famous beer kegs with non-alcohol drinks while it figures out where it stands with California liquor licence laws. SAN FRANCISCO — WeWork’s Californian tenants were dealt the second blow in months as the co-working space started putting locks on complimentary kombucha and cold brew taps, which keep people from consuming the beverages. The shackled taps appeared just a few months after WeWork stopped dispensing beer at its California locations in order to comply with state alcohol laws, which the San Francisco Chronicle first reported in mid-February. Instead of beer, WeWork had outfitted its California co-working spaces with kegs of kombucha and cold brew coffee. On Friday however, WeWork tenants in at least one San Francisco location -where Business Insider happens to have its office – discovered that even the kombucha had become a controlled substance. Thirsty tenants in the WeWork lobby – a large communal space outfitted with ping pong tables, a snack shop and dueling taps – were unable to fill their mugs with the briny beverage because of the locks. WeWork, which was valued at $US20 billion in July 2017, denied that the locks were put in place to prevent access to the kegs. “Our members absolutely love the cold brew coffee and kombucha, so we run out of it really quickly!” Elton Kwok, general manager of WeWork NorCal, said over email. “The taps are never locked when they are full between 9 a.m. and 6 p.m. We close them after hours, and we close them when they are empty so that the handles don’t break from people excitedly trying to extract every last drop. We replenish them as often as we can, but it’s hard to keep up!” he said. However, this has not always aligned with tenants’ experiences. 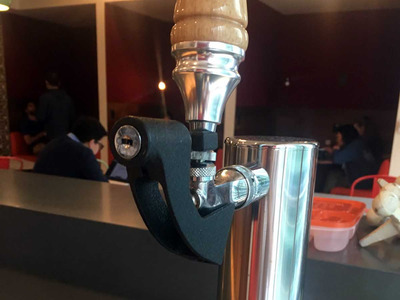 One WeWork tenant reported that WeWork occasionally put locks on active beer taps when alcohol was still served, but noted that the locks easily slip off, so he was still able to get drinks.